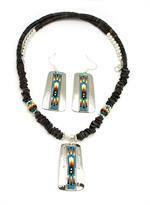 These nickle silver, beaded necklace and earrings are available on dark pen shell or white clam shell chip strand. Pendants measure approximately 2 1/4" long including bail by 1" wide at the widest. Length of necklace is about 24" long. Earrings measure approximately 2 1/2" long including silver plated wires by 1" wide at widest. 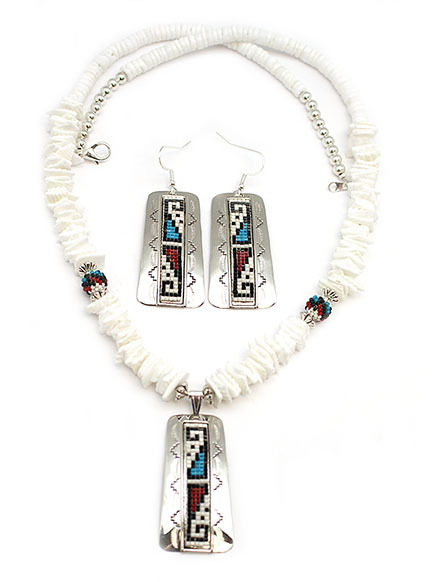 These are Navajo hand crafted by Geraldrita Whitethorne. Bead work pattern and colors will vary. Currently only available in pen shell. No white clam available at this time.